Santorini, one of the most beautiful and well known of the Greek Islands, is home to breathtaking sunsets, blue domed churches and stunning infinity pools and is crammed full of iconic photo locations just waiting to be captured! Having spent time photographing the incredible island we’ve put together a guide to our 11 best photo spots in Santorini: it’s our guide on where to take the best pictures. Enjoy. 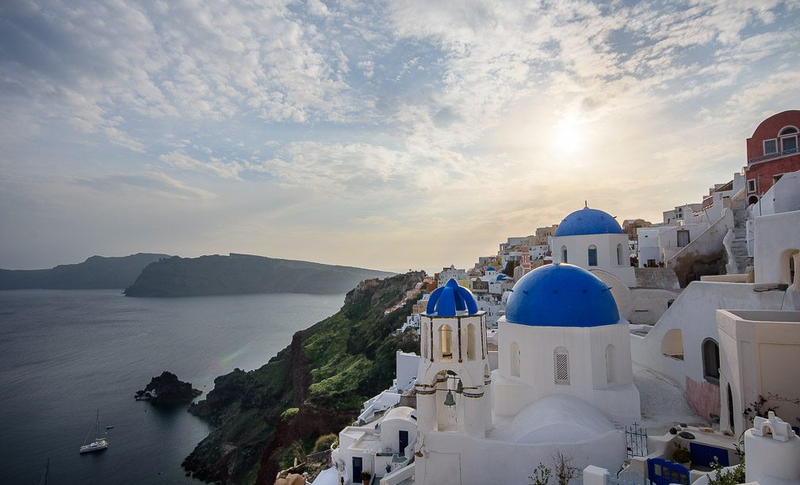 Overlooked by ImerovigliVillage, is the most picturesque spot by the blue dome churches and is home to the iconic Santorini caldera views that you’ll see in every guidebook! It’s every bit as beautiful in real life and is a great photo spot. As with Oia castle we found the best time for exploring was late evening in the run up to sunset when the warm Greek sunlight illuminates the buildings and windmill. One of the best locations for photos was actually from our cave hotel room itself (the Oia Collection) which had a view over the Caldera looking south from Oia. If you’re not staying in Oia, have dinner on one of the town’s many terrace restaurants which offer a similar view. The blue dome churches of Oia are an iconic Santorini postcard image. Try to get here just before sunset, during the golden hour, for the best light and to capture the sun going down behind the blue domed churches. Photo Location: The best location for this photo took a little time to find while exploring the caldera side of Oia. Turn off Nomikou street at Patisserie Medevio until you come to the end of the buildings. On your right, just down the steps you’ll see a stunning view of the blue domes.